When combined with vegetation, this alchemical compound releases the water and fire contained inside of the plant matter, as vapor and a burst of green flame respectively. The reaction leaves behind the earth in the vegetation as a fine powder that resembles ash. Alchemists developed this compound to remove extraneous plant matter from soil or stone, which are unaffected by the acid. The compound's effect is greatly reduced on animal tissue. It will not unravel the animal entirely, but it still causes severe acid burns and disfiguration. An explosive mixture of sulfur, charcoal, and saltpeter, gunpowder is the alchemical compound that has had the most profound impact on daily life in Corthis. When exposed to flame, the granule powder rapidly transfers from solid matter to fire. If the powder is ignited inside a narrow tube capable of withstanding the pressure and heat, the reaction causes extreme pressure, sufficient to move both Air and Earth, as the flame attempts to escape upward to the Sphere of Fire. 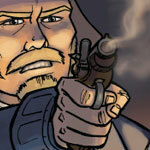 To manufacture gunpowder, the three components are reduced to the smallest size possible and thoroughly integrated. Originally, alchemists would do this with mortar, pestle, and apprentice arm-strength, but as demand for gunpowder soared, they now use stamping or edge mills made of a non-sparking material such as marble, bronze, or lead. Alchemists dampen the mixture to prevent sparking during the milling. The resulting paste is pressed into cakes and allowed to dry. These millcakes can then be shipped as is or broken into grains and packed in barrels. While charcoal and sulfur are extremely common in Japethe, saltpeter in its natural state is extremely rare on the continent. The alchemists of Saronne worked out a solution in which manure is composted with straw, kept moist with urine, then leached with water. The resulting calcium nitrate is converted to saltpeter by filtering through potash. Human offal is among the richest in nitrates and plentiful, so now carters collect much of the human excrement in cities and bring it to the powder mills, which can be found by their scent alone. Philosophers did not miss the irony that this deadly instrument of war is born of human waste. Named for the mythological bird that is the essence of fire, phoenix oil is purified fire that is reduced to an oil through a series of distillations. When exposed to air, the oil returns to its natural state, burning fiercely as it does so. Phoenix oil is almost impossible to extinguish. Earth can smother the fire, suspending the alchemical reaction. The compound was originally fabricated by alchemists to smelt, temper, and calcine, since precise control of heat is crucial to alchemical success. Military commanders quickly realized the benefits of phoenix oil and adapted it to warfare, especially naval combat. However, phoenix oil is highly volatile and use of the compound in the heat of battle was prone to disaster. 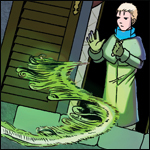 As gunpowder has developed and become more reliable, it has become the battlefield explosive of choice, and phoenix oil has returned to the alchemist's laboratory. This alchemical compound was originally developed by philosophers as a sleep aid, especially before critical surgery such as amputations or work on the eye. The compound is a mixture of opium, mandrake, hemlock juice, and henbane, which are macerated in water then soaked into a sponge and dried in the sunlight. Once dry, the sponge can be stored for long periods of time and then moistened with hot water to release the power of the compound. If the fumes are inhaled, they cause deep sleep that lasts for hours and dull the senses so the body feels no pain. 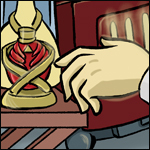 The fumes can be captured into a glass vial and contained for later use in this manner, but because of the chance for mishap with glass vials, most alchemists prefer the sponge for storage. This compound is a mixture of a number of herbs and a varying amount of aether, held in solution in a tonic. Each theriac must be tailored to the individual, based on her horoscope, which varies the herbal ingredients and their amounts. When ingested, the theriac greatly accelerates the natural healing properties of a creature, causing months of healing to occur within minutes. The amount of healing depends upon the amount of aether added to the theriac. The process is exhausting and leaves the ingestor ravenous. 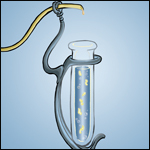 Consumption of a theriac designed for another individual results in fatigue, nausea, and possibly blindness. Aether is the rarest and most precious of the elements. It is extremely unusual to find raw aether in nature as it moves through the other elements in its winding path between the spheres. However, every living thing has aether within it, and alchemists have created an empirica (a process) to extract that aether from the other elements that make up matter. Since the amount of aether in an object is directly tied to its sentience, higher life forms carry more aether, with humans carrying the most of all. 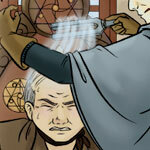 Because of the higher rewards, alchemists perform most aether extraction (commonly called Tapping) on humans. Removing the aether from a living object dampens its vitality and if too much is extracted, the subject may cease to live entirely. 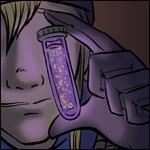 However, small amounts of aether can be extracted without permanent harm to the subject. With food and rest, the flow of aether returns to normal in a week. Alchemical guilds strictly regulate how much aether can be extracted in this manner. However, the enormous value of the aether makes the trade of quintessence a thriving one. There are plenty of volunteers (commonly called Tap-Outs) willing to trade their vitality for extra coin, just as there are unscrupulous alchemists willing to push the limits. A chimera is the unnatural modification of a natural creature using alchemy. The most common manner of modification is to blend the traits of different creatures into a single being. However, chimerae can include modifications that aren't taken from another creature, such as a bull with a hide made of iron plates. Past examples of chimerae include a winged horse, the fusion of an eagle with a horse, and a hound that could belch forth fire. There are whispers of a chimera formed from the stitched-together pieces of human corpses, but this has never been confirmed. The process of creating a chimera is not without its dangers and should not be undertaken by a novice alchemist. Creating a chimera requires an enormous amount of aether and a large degree of patience. Chimeric experiments commonly end with a short-lived monstrosity, ceaselessly screaming in pain. 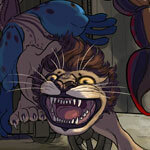 The alchemist that creates a chimera has a unique and powerful hold over the creature and can force it to obey with a word or gesture. For others, the chimera is a wild creature that must be trained as any other wild beast would be. Many alchemists find the process of creating a chimera reprehensible, as the resulting creature is an abomination and outside nature. They believe that act of creating chimerae taints the alchemist's spirits, which would inhibit them from perfecting themselves and discovering their philosopher's stone. Unfortunately, the power of chimerae or the amount of coin offered by kings or merchant princes is a lure that some alchemists cannot resist.